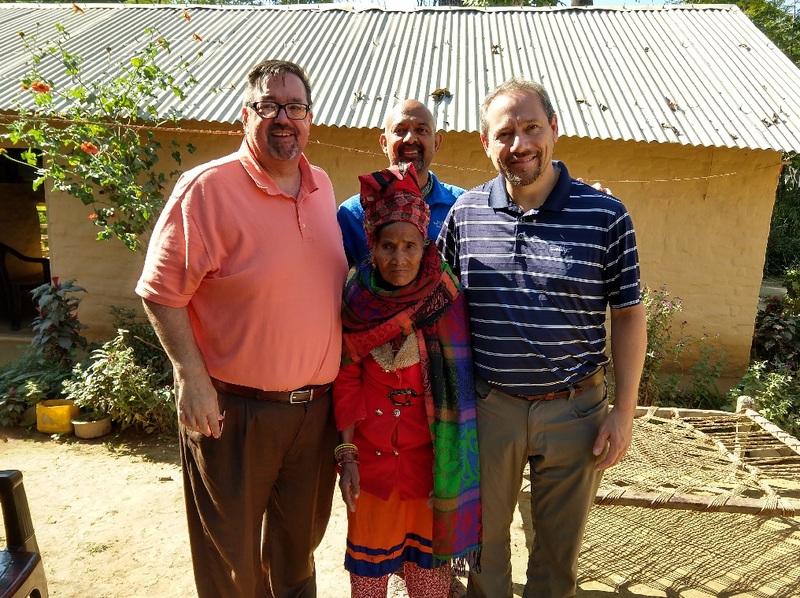 Mark and I visited Nepal and Mark’s ministry partners through his ministry, Paraklesis Ministries. It is truly amazing to see what God is doing and to see His Spirit abounding in the church there. The vision that God has given them is exciting and we feel blessed to be a small part of what the church in Nepal is doing for the Lord! The following are notes that I took from the trip that will give you an idea of what the church faces but also how God is moving so abundantly in our brothers and sisters in the Lord! 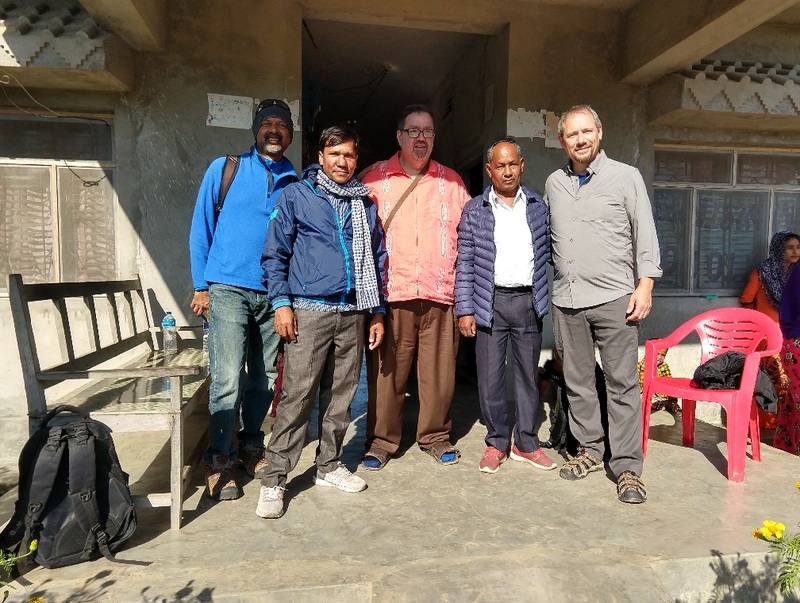 Mark Gibbs, Byron Ramhdan, and Kevin Schwartz traveled to Nepal October 24 – November 7, 2018. But for the full picture allow me to start in January 2018. The Church at Asheville commits to prayer and fasting during this month. We kick this off during the first week of January with prayer meetings every night. It was during this week that Kevin was led by God to do two things. 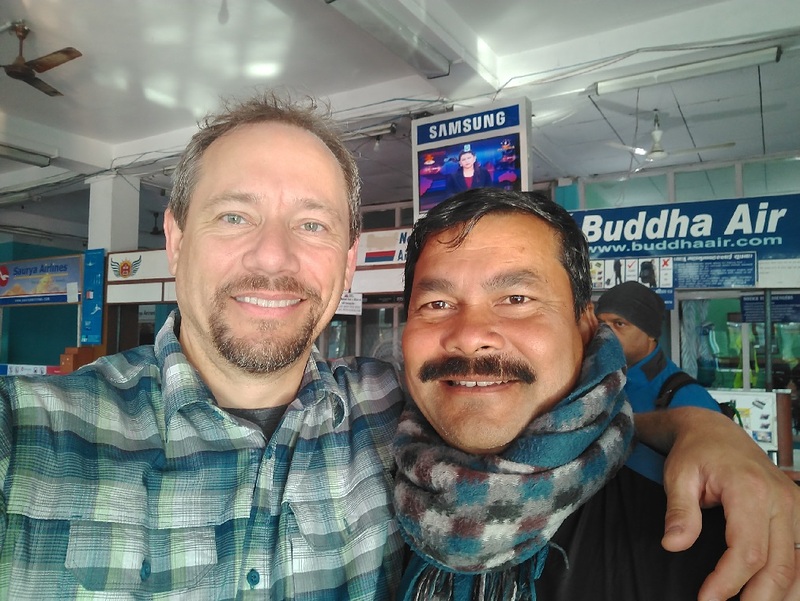 First, to confirm to Mark that Nepal should be one of his missions trips for 2018, but to do so only when Mark asked him specifically about it. Second, to go on the trip to Nepal if Mark asked Kevin. A few weeks later Mark did ask Kevin if Nepal was one of the trips he should take and then followed that, once Kevin confirmed, with asking if he should invite others on the trip. Kevin shared with Mark everything that the Lord told him and they both committed to this trip. We both felt that God was setting the stage for something special on this trip. Because Byron has a similar ministry to Mark and has a ministry partner in Nepal as well, we reached out to him and invited him to join us if he could. It was only a few weeks from departure when Byron confirmed coming on the trip with providence paying for the trip via air miles! Again, we all felt God had something special planned and continued to pray for Him to lead us as we prepared to leave. We arrived in Kathmandu in the middle of the night and taxied tonoir hotel. 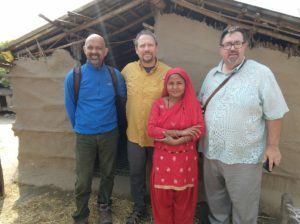 After a little rest we met up with Byron, who arrived the day before, and Sangar, his ministry partner in Kathmandu. She took us to drop off our luggage at a hostel owned by Christian friend of hers, Melan. Melan runs the hostel that his brother owns. Then we proceeded to her orphange. Sangar was an orphan. Her mother passed away when she was four. The witch doctor told her father that he needed to marry another woman or he would die. He eventually had three wives. He wanted sons and tried to kill her three times. Her sister rescued her though since she went to a Christian School and was able to get Sangar into the school and orphanage. Since she hadn’t experienced love so far in her life she did not believe the God that they told her about. When she was in the 8th grade (12 years old) she prayed that if God would love her like a father she would believe in Him. She felt his love and committed to love kids like her. She created the orphanage in 2007. She learned English by reading an English Bible and then through a trip to Israel in 2006. Because she could speak some English people began to hire her as an interpreter, which is what she does now for a job. – Need help raising the children. – Contemplating beginning a family business to help fund orphanage. We also met Daniel, a brother in Christ. 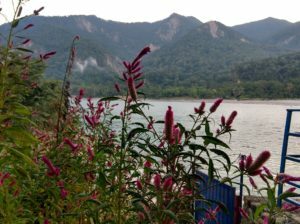 He worked in Malaysia for six years and met Christ thru friends who invited him to church. He Is a leader (elder) in his church of 500 people. Bethlehem Church. Evangelism happens through developing relationships. Education of pastor and lack of support from the poor congregation. He is seeing new converts every month in his church. People become sick because of evil spirits because of the history of witchcraft and they are seeing people healed from these illnesses when they give their lives to Christ. 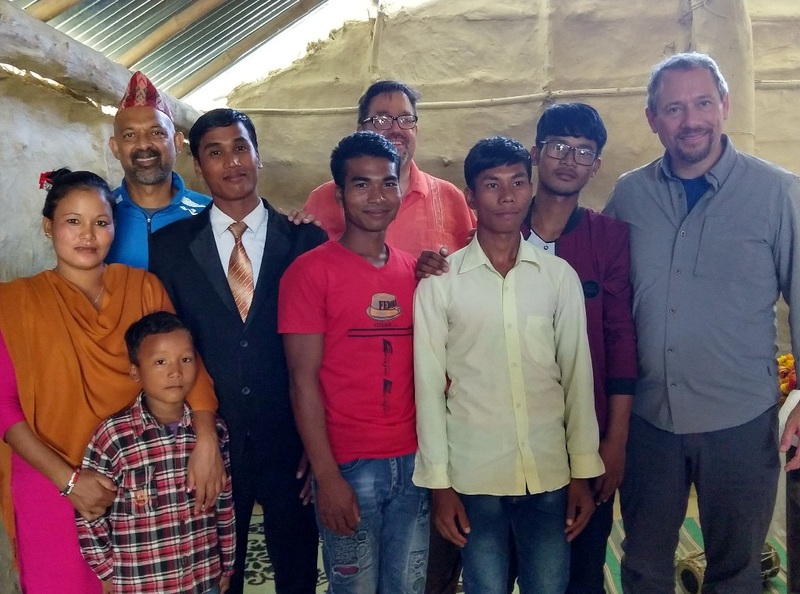 These converts make strong committed Christians. Had a hot shower tonight! Scrambled eggs, wheat toast with butter and jam, and coffee. View of Himalayas first thing in the morning. Sangar picked us up and took us to the airport. Flight delayed but finally left for Nepalgunj. Great views of the Himalayas enroute. 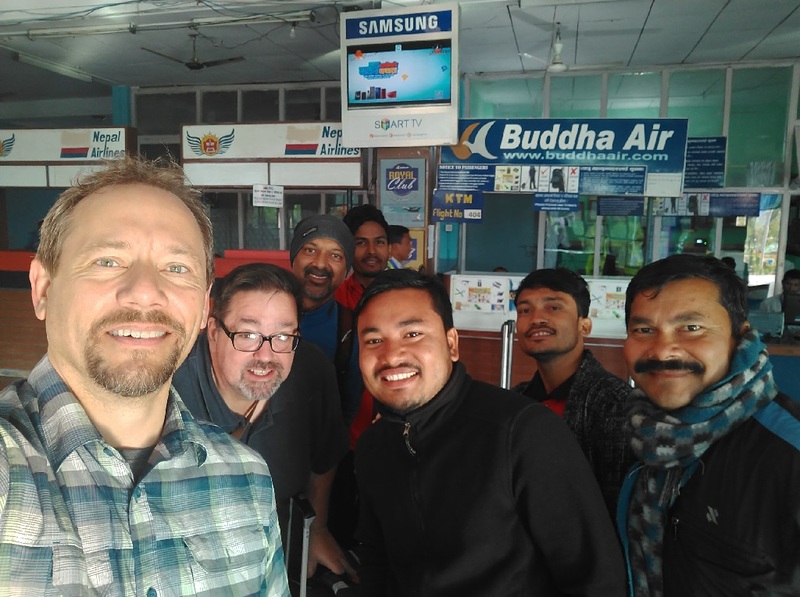 Saroj met us at the airport with his father (Chandra), a ministry pastor friend (Karan), and the driver (Khem Raj). Dropped off luggage at hotel and went to church in Ranjha. Wonderful service, Mark preached. Prayer time: lady praying and I saw vision of evil spirits, felt the same from another woman, and then prayed for girl who also had an evil spirit. She prayed but tensed up, leaned into my hand with her head, her fingers cramped together. Prayed and spoke with her mother. She has a son suffering as well. After service they fixed a place for us to eat and fed us a delicious traditional Nepali meal. Travel from Nepalgunj to Ranighat for church. Difficult road over the mountains. Stopped for coffee in the mountains and then at Suva Hotel for breakfast. 350 homes in the nearby surrounding area with an average of 10 people per home. About 40 in service. Church is around 15-16 months old. Pastor Amar knew Saroj and became a believer and then felt led to come back and open a church in his home town. One if his elders regularly walks 5 miles into the mountains to take the Word to others. 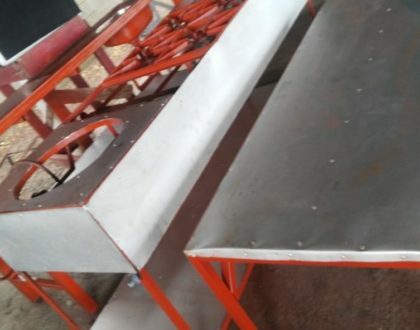 Assistance to travel in order to reach people. Encouragement – pastors are not able to work and with challenges within church they can become discouraged. Courage, Training & teaching of church members for help in ministry. 100 homes in the village, about 1000 people. Village was located miles away in the mountains but a landslide destroyed the village killing many. The government moved them on a temporary basis to this location on government land. 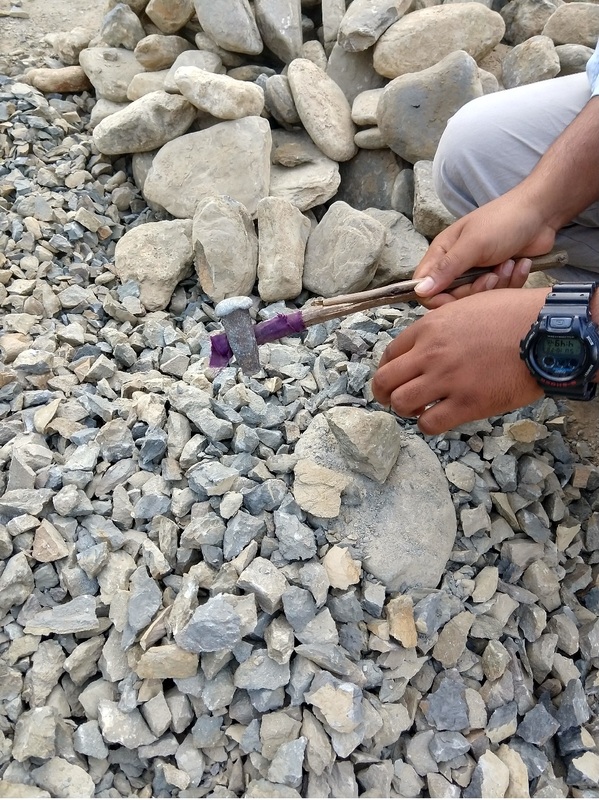 They work 7 days a week breaking rocks into stones to make enough money to buy rice. The pastor opened the church to give hope to those willing to receive it. Karan needs a bike. Price of a bicycle is $ 100. Saroj is in middle caste. 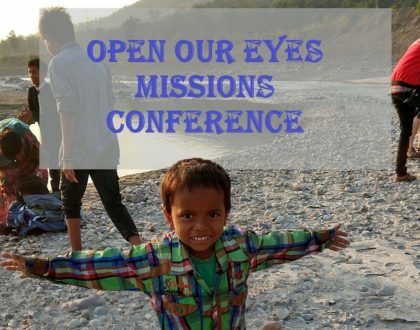 Saroj has a vision for a missions school to send people out within this part of country. I spoke on Love Without Limits. This is a very loving church so it was interesting the Lord had me speak on love. Black baby goat 8 days old. Pastor has had church for 9 years. He was a witch doctor, shaman. People came to him for healing. Years ago one of his daughters became completely blind when she went to school but could see again when she came home Then she would become unconscious (at home). Pastor’s older brother was a Christian and told him about God. His brother took his daughter to the church and prayed but she became worse. Pastor at that church suggested medication also. He spent 5000 rupees for the hospital. He became depressed because she was almost dead. When he was returning home he met a Pastor who began talking to him. The new Pastor told him he would pray for healing for his daughter and to stop taking the medication. The Pastor prayed for 2 days and the daughter was healed. When he saw this healing he had faith in God and accepted Jesus as the true God. 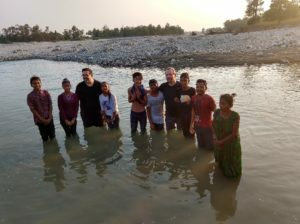 He began ministry in a village higher in the mountains and within three months 25 people were saved and baptized. Many miracles and healings took place. 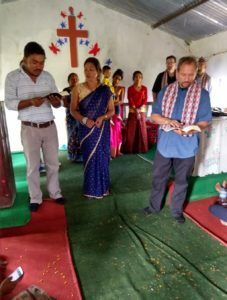 Maoists don’t believe in God and took him many times and threatened to kill him but he didn’t stop ministering. Another pastor has the other church and he pastors this church. This happened 13 years ago (around 2005). This village needs help medically. A team with doctors and/or nurses is needed along with meds. Prayer Meetings: Evangelists and Guest Speakers. More people to help reach others in the mountains. The Christians are shunned by the non-Christians, but they especially shun the Pastor. This church is a first fruits of the Nepal Harvest. Roof was the one we sent funds to repair. Lady 111 years old, saved only a couple years ago. Several struggling in prayer, but did not seem oppressed by spirits. Rather, a desire to be more filled and used by the Spirit. Church planters. Lady asked for prayer – deaf & dumb. Boy that was mentally handicapped and prayed for him and his father. Pastor was saved in 2006. Pastor’s testimony: Hindu background, three other brothers and one was sick and supposed to die. They took him to the hospital and to the witch doctor but it was no help. After trying everything, the brother left home to remove his burden from his family. A younger brother also got sick with the same problem. Until one year, again after trying everything, the eldest brother got the same evil spirit and sickness. After three years with no help or improvement the brothers were almost dead. He was very discouraged and afraid he would end up like his brothers. He wanted peace but knew he could do nothing himself. A lady from the village shared the Gospel with him. He began to think about Jesus and eventually believed. He then went to the Bible training center for five months to learn more. When he returned home his whole family wept and told him they had no hope and wanted to all take their own lives. He shared the Gospel with the family. He told them there was only one way and asked them to come to church with him. They were angry with him but they went to church and fasted and believed and were healed completely! The brother who left has never returned and they don’t know where he is. Mark felt there will be three preachers come out of the congregation present. Prayed for a young man that has issues breathing. there were some who helped but they moved on so again he needs help. Prayer for a leader who can assist. Second River is the Karnali, a large river made from run-off from the Himalayas. Meeting Pastors at Saroj’s house. Pastor that walks into the mountains 5 hours or so. 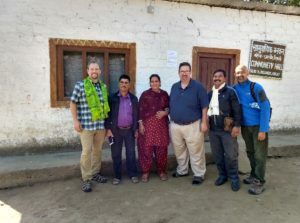 One church exists and they want to build a second Church in another village because they have 150 believers walking for hours to come to church. Need help with a roof. 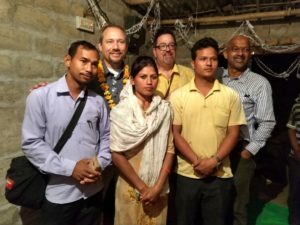 The pastor was discipled by Chandra and took over the church 15 years ago. 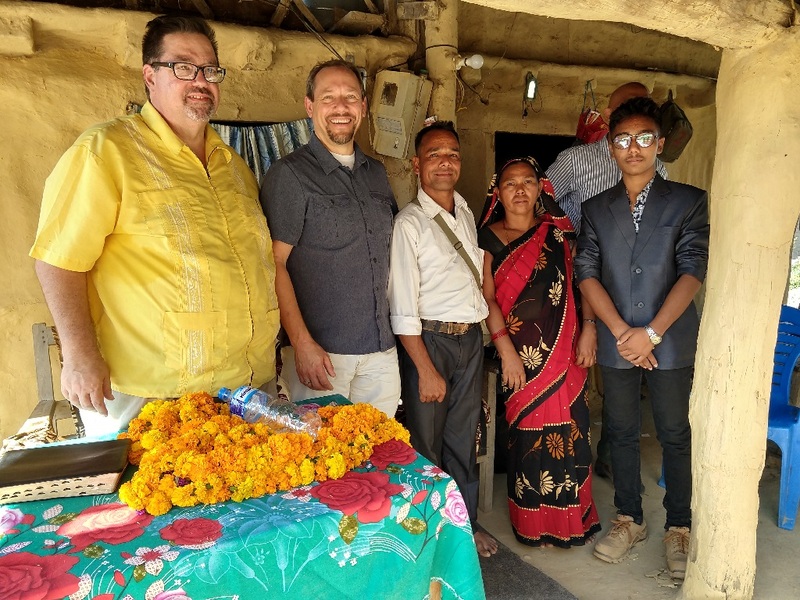 Like Chandra, this Pastor is a church starter so doesn’t stay long but raises up a Pastor and goes and starts another church. He is another disciple of Chandra. Church has been here for about 7 months. First time pastor. Very young looking pastor, but he is 32. He lives an hour away in Takiya. Pulram’s Testimony: From Hindu background and father was a witch doctor. He had a sister that left home and they couldn’t find her. After searching everywhere, mom cried alot about it and almost became sick, very depressed, 7 years. Mom had no hope, quit eating much, very weak and old. The family felt hopeless. A man came by and shared the Gospel with them. The entire family believed and accepted Jesus, except for him who was very prideful. His sister, brother, and mother went to service. The mother wasn’t even able to walk but she was then able to walk and looked happy. When he saw his mom and family and thought positive about Jesus but didn’t accept yet even though he started going to church. He heard the message at church and he believed and accepted Jesus. After accepting Jesus a few years, he got married and his wife and him felt called to ministry. He went to the Bible training center. He went for 6 months of training, but his family wasn’t happy about the decision to go into ministry and for not have a paying job. Whie he was at the Bible school, his wife told him that since his family didn’t love her she would not live with them anymore. When he returned home and his wife met him but she had no where to go since she knew she couldn’t live with his family. She decided to go home to her family but he told her that even if his family didn’t love him and she chose to leave him he would still serve the Lord. His wife understood and stayed even though the family still didn’t approve. He worked in the fields as well. He wanted to be with his family and work with them but they wouldn’t do ministry so they decided to leave home and move far away. 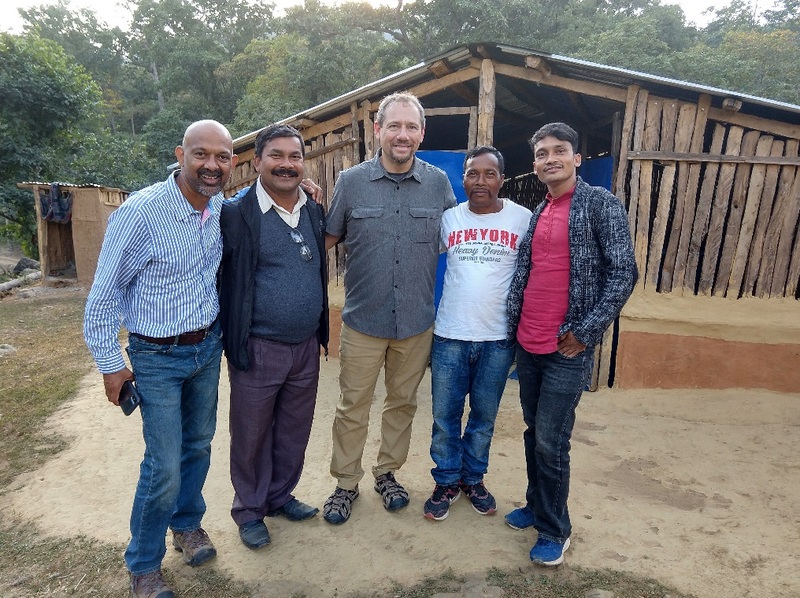 They built a small home and began ministry. He would play the drum and she would play the tambourine and sing. People would come by to see what they were doing. Slowly people started coming to Christ. One person in the village worked up some of the village and threatened to beat him and throw him out of the village. Even with that there was a man who did witchcraft in the village and threatened them with curses. They were not concerned but others in the church were. They still didn’t give up and after a month and a half, the witch craft man died. That’s how they came into ministry. I told him about seeing Hindu gods and religious things during service even though I also felt the love of the Spirit. His aunt, who was in service, has received death threats because she prays. The villagers believe it’s her prayers that make people sick and have to go to church. Elder man was a Sadhu (Hindu priest) his children began to die one by one and then his grandchildren. He was very depressed. 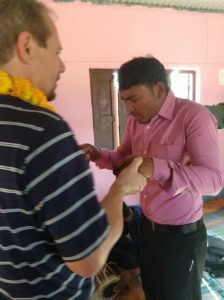 He met Pastor Pulram who told him if the Gospel. He believed and his remaining son and grandchildren lived. He gave a gift of land to the church and they built a church on it. No support from family and is alone in the ministry. Prayer for encouragment, pray for support for his family so he can send his kids to school and continue in ministry. 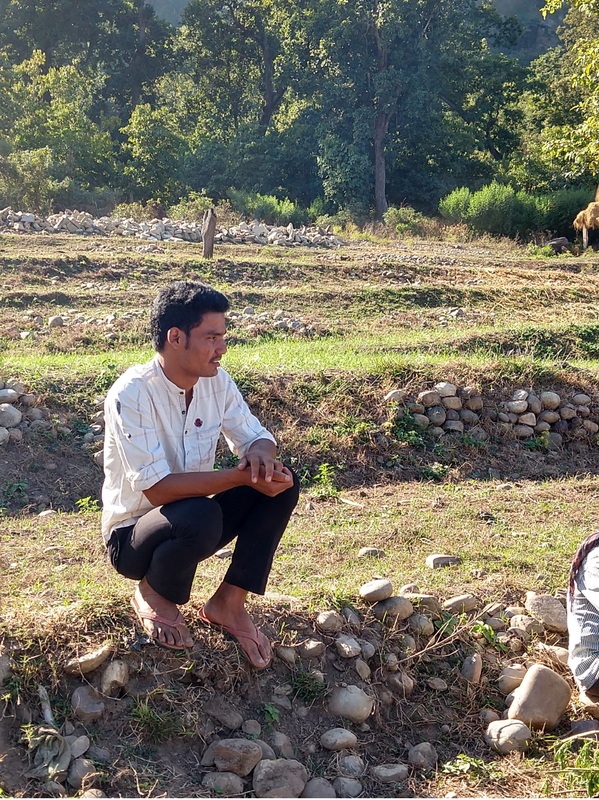 Village by the bridge: Karnali, this is where Saroj grew up. He grew up with grandparents because he was the eldest son from the eldest son and was the favorite. No building, meet under sheets at a believers home, rotating between homes. The photo with the first believer, she also donated land but they have yet to build. The church has met here for just over a year. He is one of Chandra’s disciples. 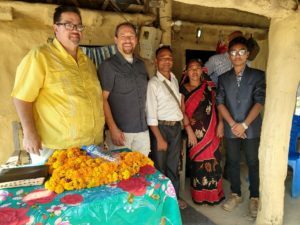 Pastor lives 20 km away in Tilakpur. He walks to the church. Hindu background, evil spirit attacked his wife and made her mad, unable to walk. They tried witch doctor and everything else they could but nothing worked. Hopeless and depressed. Then he met Chandra who shared the Gospel with them. He accepted Jesus and within two weeks his wife was completely healed. As his wife was healed he grew in strength and was discipled by Chandra. He assisted in Chandra’s church for a few years. He wanted to serve and eventually was given this church to Pastor. They accepted Jesus 15 years ago (2003). Praying for a place to worship together. The home they meet at changes so people get confused where to go and drop out. Pastor has been discouraged about this. The land for the church is 1 km from where they meet now. Pastor’s wife has kidney stone. Prayed for healing. Pastor Nikita had a burden for her village and began to meet in her home about 6 months ago. About a dozen in fellowship now. I spoke on the Armour of God and being warriors for Christ. It will be amazing to see what this small group of believers does! Director of the orphanage and the school along with second man. From the village and had a burden for the children, some have parents, others do not. They can get labor jobs. Make enough to eat that day. The Brahman high caste do not listen to their needs. The king and royals before never listened to their needs. they get weaker every day. Now that they accept Jesus has brought them closer. the Christians in the higher caste will listen and help. But education and basic needs are not well met. They feel hopeless and live like they are in the Stone age. Pray that whatever situation they have in their lives that the future generations will not be kept down but that they receive education and help. The teenagers that spoke English we’re sent to school through the assistance of Christians in higher caste but they are back since the assistance stopped. Government helped with a building but there are no teachers. Teenagers are still in school. 4-5 Teachers needed for the hundreds of kids. Wen Lal is not here, home next to church. 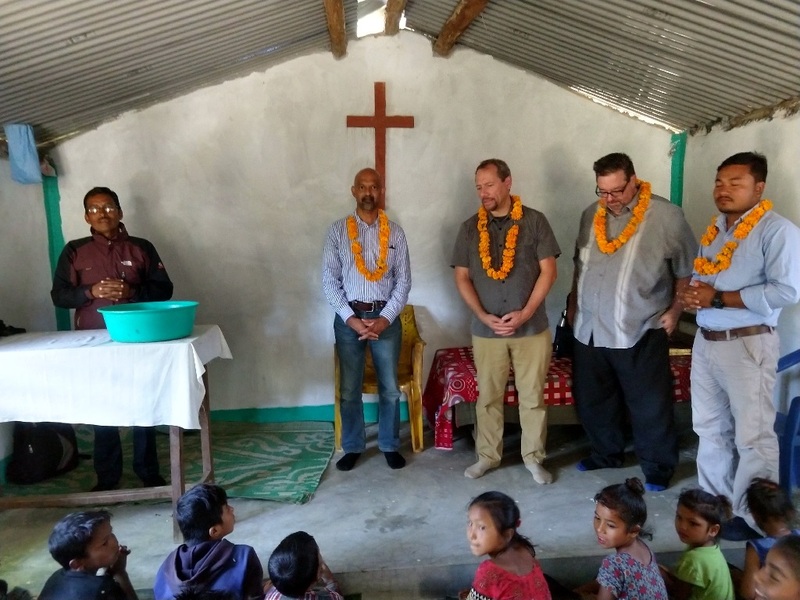 Four were saved at this service including Pastor Surendra’s wife! She has been helping serve people but did not accept Christ until today. When she was young her mom was sick and her father was a witch doctor. they couldn’t make her well. Her brother was a Christian and went to the Bible School in Kathmandu. He told the family the mother would not get well with Jesus. A miracle would happen and she will be healed. Another Christian and her brother prayed for one week and her mom was healed. When Soniya saw this she began to think about this. When she finished high school she went to visit her brother who was now in ministry and he would share Gospel with her and she went to church. After a few months she believed and the brother encouraged her to go to Bible College. She didn’t know any of the Bible or Bible Studies which made it difficult to study. She was baptized at the college. She forgot to mention that when she was with her parents she used to throw stones at the Christians. There was a Christian Church near her home and their worship made her mad, hence throwing stones. Her parents became Christians last year (2017). That afternoon we met at a small tributary of the large Karnali River for a baptism service. Mark and I were priviledged to baptize eight people in the Name of Jesus for the remission of their sins!! God is good! Church has been here for 9 months. She is related to Saroj through his mom. She was a believer and Saroj and Chandra would come out and pray. More people came to believe so they sent her to the Bible School so she could be the Pastor here. Saroj and Chandra come out once a month still. Her home is directly across the small courtyard from the church. Hindu background. Big problem in his family, only one brother had evil spirit made him mad. They tried everything, witch doctor etc. He would wander around everywhere. They didn’t know what to do since nothing helped. Finally a lady from the village came by their home and shared the Gospel with them. She told him to trust in Jesus and nothing else, come to church. As soon as she shared the Gospel, the entire family believed and accepted Jesus that day (7 family members). They went to church for one week and within that week the brother was healed!! It’s been 14 years (2004) since he became a believer, 7 years (2011) as Pastor. As he prayed he felt in his spirit that there was more for him to do. He went to Bible School for a short time and then began Pastoring. 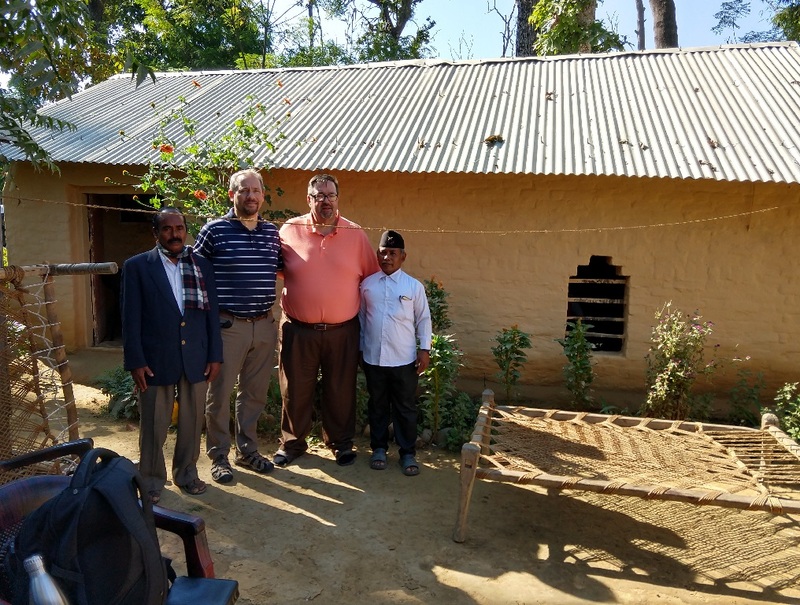 His brother now assists him in the church but also has a job he does in India. Karan is now ministering in two places. When Daniel returns from ministering in the mountains he will take the second Church to Pastor. Name of 16 year old boy: Puskal Baraili. He said he wanted to go with us to the U.S. Byron shared his testimony with him. Incredible time of talking, singing, and saying good-byes. Mark’s ministry of love and encouragement was felt so strongly tonight! Chandra was saved 20 years ago. He was Hindu and like many others faced trials that led him to the Cross. He went to the Bible School for a couple months but reading the Bible is how he faced the daily challenges of being a Christian in a Hindu culture. He realized that he needed help sharing the Gospel and began to disciple others. Many of the current pastors of the churches are the people he discipled. It just feels and looks like the book of Acts! They have such love and humility that it draws you to them. Chandra would walk up into the mountains to start churches and tell others about Christ. Many times, his wife would ask Saroj to go along with him to keep him company. Saroj was more concerned with making money in his early adulthood. The years of learning to serve others as his father did not stay far away though. He felt called into ministry and went to Kathmandu to the Bible School. He met Soniya at the school but dating is not allowed. They often drew each other as study partners and this gave them time to get to know each other. As they realized their feelings for each other they had to hide their feelings so they wouldn’t get kicked out of school. They are a beautiful couple together with a son, James, who is 3 years old. In 2017, they gave birth again but this second son only survived a few months. Saroj is passionate about spreading the Gospel and training up others to do the same. 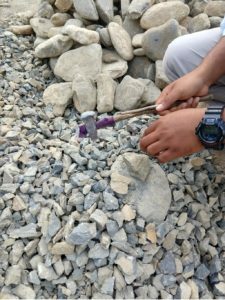 They have a vision to create a Training Center in Lamki. The goal of the center is to train people to be leaders in the church as well as new pastors and evangelists in Western Nepal. 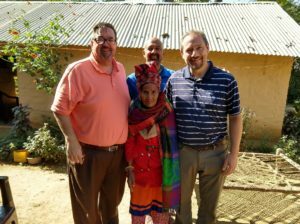 On this trip we brought funds to purchase 300 Nepali Bibles, evangelism equipment, and bicycles for five pastors. While there is a lot of needs (which we will prioritize and begin seeking ways to assist them), the love of God is strong in the Nepali Church. 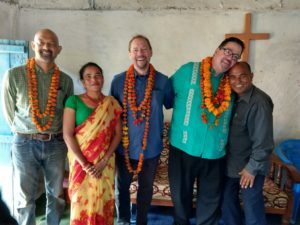 The current churches are the first fruits of the Nepal harvest for the Lord and it is these same churches that will be trained to bring in the rest of the harvest. 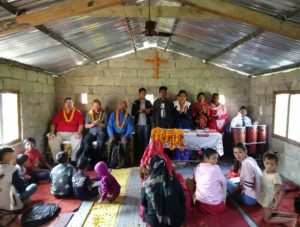 With less than 1% of the population in Nepal that are Christians, there is a lot of work to do. 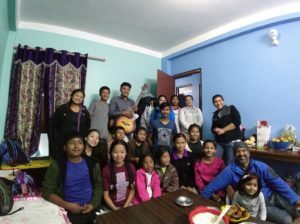 It is exciting that God has connected The Church at Asheville with such an amazing Church in Nepal at such an amazing time!! God is on the move in some pretty big ways and continues to place our family in the midst of soul winning around the globe. We are so blessed!